This week we have been speaking to Warwick Castle about their new Falconers Quest show, as well as some other exciting new school workshops and events taking place over the coming year. Hi Nick. 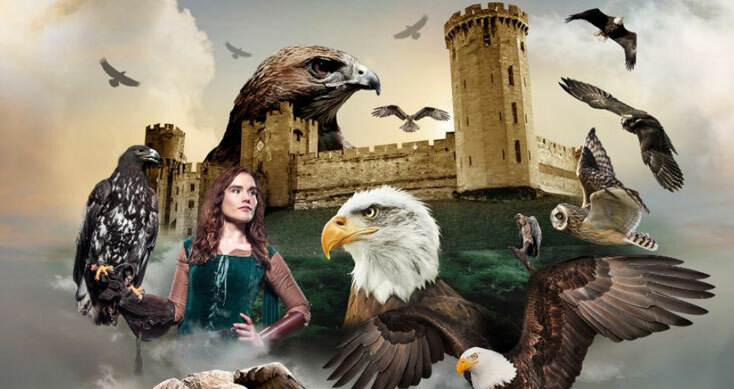 Falconers Quest is a huge new show for Warwick Castle, can you tell us a little bit about what it entails? "That’s right; I’m really excited about it! Our new bird of prey show is an incredible, narrative driven experience that takes place within the castle grounds, beside the river Avon. It is called ‘The Falconer’s Quest’ and it chronicles the journey of a young falconer who wants to become the master falconer of the Castle and for this, she needs to search the land for the biggest and most impressive birds of prey and trust me, they are impressive! We found that our current Bird of Prey display was always incredibly popular with schools and now the Falconers Quest - with up to 70 birds of prey in the air throughout the show - will be the biggest bird of prey show in the UK! How does this relate to school trips, are there learning outcomes that link into the curriculum? "Of course! The Falconers Quest hits several key curriculum points with story-telling, biology, wildlife, conservation and physics, including the historical links of birds of prey being used to hunt by the wealthy – I wish I had a pet falcon! Is the Falconers Quest open all year round? "What makes this a fantastic experience for schools is that it’s showing on every single day from April 6th all the way through to October 31st (unlike our August summer holiday jousting!) and the show is included in the school ticket entry cost for no extra charge! What does a day at Warwick Castle look like for schools? "There’s so much to see and do in the castle grounds, most of which can be done in any order, but to get the most out of your day, I’d recommend watching all of the available daily shows and visiting some of the key features Warwick Castle. A example itinerary of what a summer-term day might look like for a school is: 10am - Arrival 10:30am - Watch the Castle’s Bowman as he explains the history of archers and ranged weapons, in addition to hitting the bullseye (he rarely misses!) 11am – A visit to the Great Hall and State rooms within the main building of the castle to see the incredible weapons and armour on display as well as waxworks of important historical figures. 11:30am – Pause to witness the mighty Trebuchet, the largest working medieval siege machine in the world, launch a projectile over 200 meters! 12pm – Time for a spot of lunch! If the weather is nice, picnics are welcome; otherwise we have lunchrooms available to pre-book. 12:30pm –Watch up to 70 birds of prey take to the skies in the Falconers Quest! 1pm – Climb the Towers and Ramparts to get an incredible view of the Castle and all of Warwick. There’s nothing quite like reaching the peak of our tallest tower! 1:30pm – Book into one of our many exciting curriculum linked workshops such as Swords & Shields (timeslots are available to pre-book in advance) to engage your students even more! 2:30pm - We find most schools leave around this point so they can get back to school on time, but since the castle closes at 4pm, there’s still plenty to see and do if you wish to stay! Your education packages cover off a wide range of historical topics that teachers might not be aware you cover? Can you talk a bit about the historical periods other than the medieval period that you cover? "Absolutely, we cover over a 950 years of history at the Castle and have links to all areas of British history, from Anglo-Saxons, the medieval ages, the Tudors, the Victorians and right through the 20th Century where the Castle was kept as a stately home until it became the world famous visitor attraction that it is today. We’re also happy to cater our topics if needed as we always have experts on hand (I’ve personally learned a lot from them!) Due to the topics of the curriculum, we are most popular with Key Stages 1-2 (with our strong links to Castles, the Norman Conquest, Kings & Queens, Crime & Punishment, Stories & Legends and more!) followed by Key Stages 3-4. We also have lots of older college and university students who visit during the summer term (mostly for the shows and Castle Dungeon!) as there isn’t anywhere else that offers the same experience as Warwick Castle – it’s a jam-packed day of discovery, escapism and fun! Can you tell us a bit about any new workshops coming to Warwick Castle this year? "We found that when it came to our educational packages for schools, the more immersive and interactive, the better! That’s why we’ve added a new type of educational package in addition to our popular history tours and shields workshops that make use of our wonderful history and acting teams who really bring history to life! 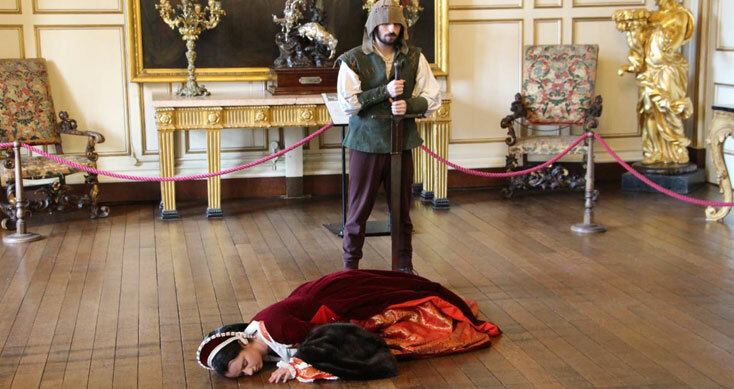 The first of these is called ‘Execution of a Queen’ that is a dramatic presentation of the rise and downfall of Anne Boleyn and focuses on the last few days of Anne’s life and her execution as told by our experts in the subject matter. I’ve always found Anne Boleyn’s life as the Queen of England fascinating and I’m certain that visiting students will too. The second one, ‘Votes for Women,’ I find to be incredibly important, as it looks back at the Women’s Suffrage movement, a campaign like no other in history. This dramatic presentation features key events and people that made the movement possible and has been written and adapted with the help of original source documents. The third one I’m really excited about. It’s based on ‘Victorian Warwick’ and is a workshop that immerses students in Warwick Castle’s Victorian life. They learn from a castle butler some of the jobs expected of a servant and the rules by which they must live. After having prepared tea, they will meet Countess Daisy who will lead them on a discovery of how much life has changed at all levels of society since Queen Victoria first ascended to the throne. Afterwards they are taken to the Mill and engine house where they can actually experience the noise and spectacle of the industrial revolution with our engineer who, for the first time in many years (he’s excited too!) and exclusively to schools, will help them fire up the massive generators and pumps in order to see how electricity and water was created and distributed around the castle. What are some of your personal 'must see' things at Warwick Castle that students should see? "A lot of planning goes into bringing a school trip to Warwick Castle, that’s why creating an itinerary that looks at the best bits can be tricky (that’s why I recommend a full day out!) Without a doubt, I’d recommend seeing the Trebuchet in action as you can really picture it getting used in a huge battle to siege castles and towns, there’s nothing like watching medieval STEM in action! I also love the view from the top of our tallest tower, as you can see all of Warwick and most of Warwickshire from the peak, it’s over 500 steps to complete the journey around the main towers and ramparts, but it’s definitely worth it. Medieval STEM sounds like a great learning experience for school groups, is the Trebuchet used on a daily basis or are there only certain times when this is used? "The Trebuchet fires twice a day, every single day from Easter up until the end of October, then it takes a rest during winter as it gets a lot of wear and tear that it has to recover from. As you can imagine, such a large medieval siege machine requires a lot safety checks and maintenance, but it’s absolutely worth it – I try to see it whenever I can! We also offer pre-bookable Trebuchet Talks from our own Trebuchet Masters (it’s a real job title!) outside of the Trebuchet show that gets even more into detail on how these incredible weapons function to help support STEM studies. As a school trip venue what would you say is the biggest draw to your venues from a teacher's point of view? "We are constantly developing new and exciting ideas for schools, and currently have over a dozen curriculum-linked tours, talks and workshops that feature specialist topics. As you may have guessed, we have a particular focus on History which means students can learn from the experts about the changing power of monarchs, significant battles in British history, even crime & punishment throughout the ages. Warwick Castle is an incredible place for historical escapism that students of all ages and studies can enjoy and we work with local teachers to ensure our school products remain fun, relevant and engaging to students, which is a big part why school trips are so memorable to students years to come. We also try to make the booking and planning as easy and hassle-free as possible to make school visits fun for the students and teachers! 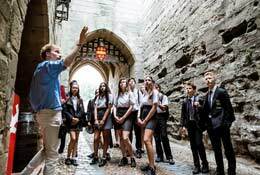 If you are interested in hearing a bit more about how Warwick Castle can help you with planning your next school trip then why not get in touch here. The UK's biggest Birds of Prey Show at Warwick Castle! Let your imagination soar as you join Warwick’s Falconer on an epic quest of discovery to find the finest Birds in all of the land, in this brand new, action-packed, spectacular show. Learn outside the classroom at Warwick Castle: A fortress over 950 years old! Experience the fun of real history with educational Tours, fun curriculum based workshops and daily shows that include our incredible Birds of prey and Mighty Trebuchet!